Are you ready to ride the rainbow to the treasures in the Cai Hong Free Slot? This new Chinese-themed free 5 reel free slot game from Realtime Gaming features a classic rainbow, a good luck charm, and the powerful Chinese God of Wealth, which in combination bring you treasures beyond your imagination. This game features 30 fixed paylines and several free games, bonus features, and prize multipliers. It also features several symbols including an ox, rabbit, dog, roosters, and tiger, all which symbolize the Chinese years. If you play Cai Hong, be ready to be showered with a lot of fortunes. 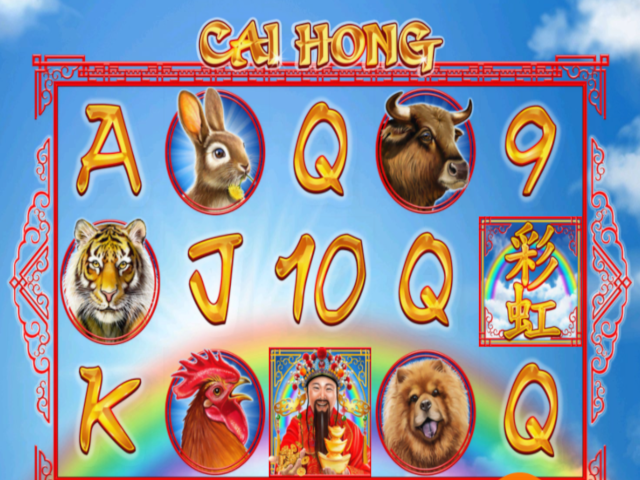 The Cai Hong free slot features excellent graphics in lively colors including red, which is closely associated with the Chinese tradition and culture. Against a cloudy sky, you can see the symbols since the reels are transparent and seemingly float down across a soothing backdrop image. This online slot game also comes with a complete jingling soundtrack accompanied by the game’s mechanical-effect sounds. The 30 fixed paylines are active at all times. If 3 or more identical symbols appear in an unbroken pattern running from the left to the right across a line, you have earned your reward. You will also earn smaller wins if you see the 9, 10, J, Q, K, and A traditional playing card symbols. The animal variety in the game can earn you some of the biggest rewards if they are lined up with a gold ingot and some gold chains, which are the game’s most valued icons. The God of Wealth represents the Wild symbol, and doubles the value of any winning combination you create. The rainbow scatter symbol triggers the free spin feature whenever it appears in at least 3 locations at once. You can a sequence of lucky coins before the start of the bonus games, which give the Cai Hong slot game its outstanding ability of granting happiness and wealth upon layers. You have access to 8 free spins and all the wins’ value is doubled. However, if 3 scatter symbols activated the feature, just click 2 lucky coins to reveal higher multipliers and extra spins. 4 scatter symbols will guarantee you 3 selections and if 5 or more scatter rainbows show up, then you will be able to pick 4 of the lucky coins. Each pick increases the number of free games or boosts the multipliers. With a good fortune, you can earn 33 free games and each win’s value is multiplied 15x. Moreover, if at least three of any scatters land in a single free game, you will earn 15 additional spins that will be added to the feature’s end. Therefore, the rainbow scatter symbol can help earn a big fortune. The Cai Hong is one of many internet free slots and sticks with convention in several ways that provides players with fairly standard Chinese-inspired symbols, which have been realistically designed to give the slot an appealing appearance to its fans.